No setup! Just launch the app and point. Doesn’t need internet to work (read instructions). 1. 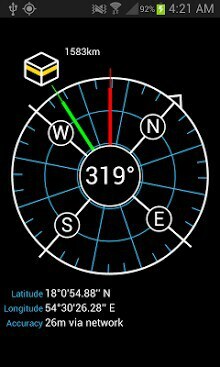 This app uses the built in compass to indicate bearing, the network (3G or WiFi) for an estimated location (optional), or the built in GPS for an exact location. 2. In order to work offline (i.e. without using a network or when there is no reception) you must be outdoors to get a GPS lock. 3. 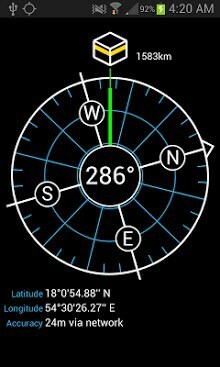 In order for the compass to work you might need to recalibrate it by moving your phone in a figure 8 motion, the app will notify you if it’s necessary. Also move your phone away from any metal objects or you’ll lose the calibration, the app will detect any interference and notify you immediately. Needs location and gps permissions. Forces screen to stay on. Product of Oman. Designed to determine the qibla in remote areas like desert oil rigs where there’s little or no reception. Works even better in cities too.